Our organization is known for offering a comprehensive range of Twin Screw Extruder for Powder Coating that is known for its optimized extrusion process. Manufactured as per the set industry standards, these are extensively in several industries such as Material Handling, Pharmaceutical, Packaging and Food Processing. Further, these are widely appreciated for their efficiency and rotating speed. A compact unit for the off-line production of Powder Coating Paints. Sample, which can be produced at rates of up to 40-50 Kg/ hr. This Pilot Plant, is typically used for colour matching, customer evaluation, research and production control. The equipment finds application in the development of new formulations and at raw material suppliers for the quality control of resins, pigments and additives. A 30 mm Twin Extruder constructed of high wear resistance steel and capable of producing up to 40-50 Kg/ hr (max) and 0.250 Kg (min). The Screw can be set at variable speed and feed is manual. The barrel is heated by 10 electric cartridge heaters and the temperature are digitally controlled and water cooling is also directed along the length of barrel for effective results. 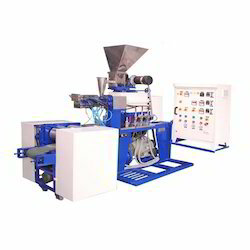 Looking for Powder Coating Twin Screw Extruder ?